...even if it is cold. Spring break 2013 saw Victoria, Vicki and me in Paris (and Yorkshire and London). 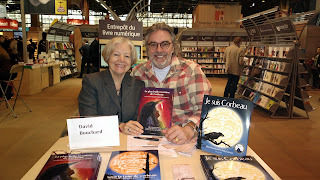 Seven years ago, they invited us to the "Salon du Livre", the largest book fair in the French world. We were so well received that they invited us back...and back...and back... This was our seventh consecutive year and we are already anticipating next year. We left a few days early as Victoria's spring break had kicked in. We spent these days with cousin Garry, the Duke of Yorkshire. Garry and his boys guided us through and around their Dales and quaint villages (I don't think we missed a single pub). Yorkshire is experiencing record breaking cold. Their lambs are dying in the fields. We witnessed this hardship yet we loved being there. Then, over to our regular hotel in the Quartier Latin...and a week in Paris. My French publisher is Winnipeg's Les Edition des Plaines, amazing people who know every in and out of the industry and make sure that my books are highlighted at every turn. Our new release Dreamcatcher and the Seven Deceivers will be coming out in French as well as in Chinese and Spanish. We are slated to travel to China's book fair in the summer of 2014. I'd like to say it gets better but it really doesn't get any better nor are people any nicer than my publisher Joanne and my senior editor Hugette shown here.